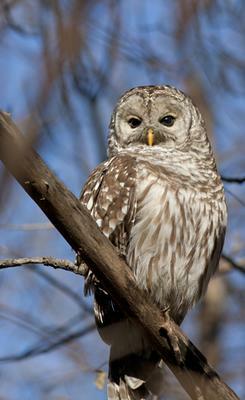 Barred Owl - did the one you saw look like this? We recently moved to the Tamworth, Ontario, area and have been lucky to watch and listen to a family of owls for over a week now. We drove out to the mailbox by the road on our way into town one morning and three owls flew out of the pines in front of us settling in the trees across the road. Pictures were difficult to take as they camouflaged so well and were somewhat skittish to our presence. That evening the sounds from the bush around the house were eerily captivating. We had no idea as to the source since we never witnessed an owl invasion before. At first I thought it may have been a fisher or lynx as the sound suggested a catlike scream to it. We sat in the dark in our three-season room at the front of our house and were mesmerized for over two hrs. We gave up trying to find the source with our mag-light and retreated to the house. Within minutes I noticed the sound was closer than before and returned to try the light again. I was excited to see two of the three owls perched on the pines close to the screen porch. Identifying the breed of owl was difficult as there were a couple of possibilities given the spotted pattern of the feathers. We tried to identify through "sounds of owls" and nothing compared to the screeching sounds that we taped on our cameras. We believed the owls to be of the "Barred owl" family but the sounds were not even close there was no "who who who's cooking your dinner" ballad, just screeches. Finally, a site offered sounds of young Barred Oowls and our search ended! The audio that we have collected over the past week is identical. The owls appear to be in the young adult stage. Last night at the kitchen window the chorus of screeches began again but this time the background singers showed up with their rendition of "Who who who's cooking your dinner". Thank you for sending this report to us, I will also post this on our facebook page so that our facebook followers can also enjoy it!